Author(s): Rena Chiotaki, Hara Polioudaki, Panayiotis A. Theodoropoulos. University of Crete, School of Medicine, P.O. Box 2208, 71003 Heraklion, Greece. Breast cancer stem cells (BCSCs) represent a heterogeneous subpopulation of rare cells within breast cancer tumors, displaying an enhanced tumor initiating capability and underlying disease progression and therapy resistance. Unraveling their phenotypic, biological and functional profile is a major challenge in the context of diminishing patient mortality. In this review, following a brief description on how cancer stem cells (CSCs) and their microenvironment contribute to tumor preservation and heterogeneity, we summarize the current literature regarding the molecular signature of BCSCs either localized in the primary tumor or circulating in the blood of breast cancer patients. We present recent data on specific stem and epithelial-to-mesenchymal transition (EMT) markers designating the BCSC subpopulation and underline their pathogenic significance. The molecular characterization of BCSCs has promoted the design of novel therapeutic approaches targeting the BCSC subpopulation which are currently being experimentally and clinically evaluated. We highlight recent advances on the development of novel BCSC-targeting therapeutic strategies including the inhibition of cell signaling pathways, differentiation therapy, metabolic interference and nucleotide-, bio- and nano-technology based approaches. Eliminating the chemo- and radio-resistance properties of breast cancer tumor cells via BCSC-directed therapies, combined to conventional therapeutic approaches, will augment the effectiveness of breast cancer treatment and improve the clinical outcome of breast cancer patients. Keywords: Breast cancer, cancer stem cells, circulating tumor cells, epithelial-to-mesenchymal transition, targeting of cancer stem cells. Affiliation:University of Crete, School of Medicine, P.O. Box 2208, 71003 Heraklion, Greece. 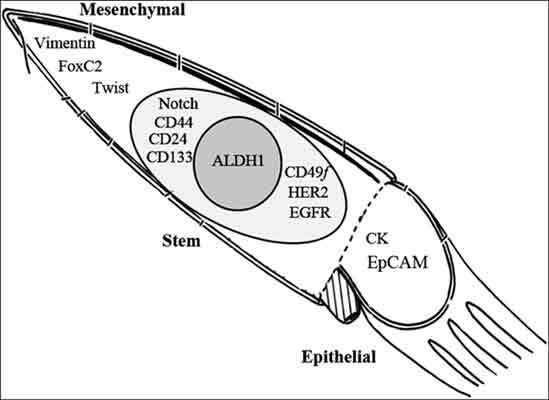 Keywords:Breast cancer, cancer stem cells, circulating tumor cells, epithelial-to-mesenchymal transition, targeting of cancer stem cells. Abstract:Breast cancer stem cells (BCSCs) represent a heterogeneous subpopulation of rare cells within breast cancer tumors, displaying an enhanced tumor initiating capability and underlying disease progression and therapy resistance. Unraveling their phenotypic, biological and functional profile is a major challenge in the context of diminishing patient mortality. In this review, following a brief description on how cancer stem cells (CSCs) and their microenvironment contribute to tumor preservation and heterogeneity, we summarize the current literature regarding the molecular signature of BCSCs either localized in the primary tumor or circulating in the blood of breast cancer patients. We present recent data on specific stem and epithelial-to-mesenchymal transition (EMT) markers designating the BCSC subpopulation and underline their pathogenic significance. The molecular characterization of BCSCs has promoted the design of novel therapeutic approaches targeting the BCSC subpopulation which are currently being experimentally and clinically evaluated. We highlight recent advances on the development of novel BCSC-targeting therapeutic strategies including the inhibition of cell signaling pathways, differentiation therapy, metabolic interference and nucleotide-, bio- and nano-technology based approaches. Eliminating the chemo- and radio-resistance properties of breast cancer tumor cells via BCSC-directed therapies, combined to conventional therapeutic approaches, will augment the effectiveness of breast cancer treatment and improve the clinical outcome of breast cancer patients.